In an interview with the Hon. Manuel Heredia Jr. on Tuesday June 21st, he announced the United Democratic Party's (UDP) slate for the upcoming municipal elections. Up for the Mayoral post is Mr. Daniel (Danny) Guerrero. 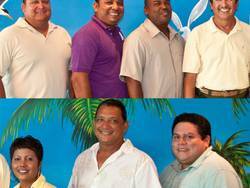 Running for councilors are Gabriel (Gaby) Nuñez, Carlos Barrientos, Kenrick Bracket, Yolanda Parham, Mr. Guillermo Mito Paz and Dr. Severito Guerrero. "San Pedro is made up of a diverse culture. The days when the destiny of our community was controlled by local San Pedranos are long gone. Over 65% of our voters' listed today are not originally from San Pedro, and those 65% we have to make sure that we take care for them and we have to nurture them so that they feel at home. We have to work together, embracing everybody that lives on this island. " The Minister went on to explain that he is very pleased with the choices that were made, with the candidates representing the vast majority of the residents of the Island. He made special mention of Mrs. Yolanda Parham, representing the female populace; Mr. Kenrick Bracket - a Creole descent who migrated to the Island from the city; the induction of Mito Paz - NGO candidate who has dedicated his life's work to sustainable development; and representing the nationalized Belizean residents of the island, Mr. Carlos Barrientos. "I must say that I believe this is the best team that we have and I am confident that along with me, we will be successful." These candidates, along with Mr. Heredia will be officially endorsed on July 9th, the date set for the endorsement of the UDP slate to contest the 2012 town council election as well as Mr. Heredia for Area Representative for the upcoming 2013 general elections. While Hon. 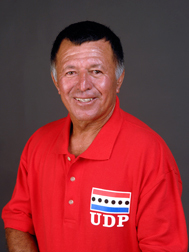 Manuel Heredia Jr., current Minister of Tourism Culture and Civil Aviation, has not officially announced his intent to contest the upcoming 2013 general elections on behalf of the United Democratic Party (UDP), it is almost certain that he will. In a recent interview, we inquired about his thoughts concerning the recently elected Ms. Ana Patricia Arceo to represent the People's United Party (PUP) in the Belize Rural South (BRS) constituency. "One thing with me, everybody that knows me. My thing is the people. I always think about the people. I believe that when I ran with Patty the last time, they [PUP] were in Government. They had all the money in the world that they want. She was extremely charismatic and popular at the time and I managed to win. Today regardless of what they say that I am not delivering, when I start to mention what I have done in particularly in the field of education and other things and what will be coming shortly, I think that with the limited resources that this administration has, with the way I think that I have been the same Manuel Heredia that I was when I won and I will continue to be that way, people know me well. I will never underestimate anybody. I like all my San Pedranos, regardless if they are PUP or UDP and at the end of the day, if the people feel that I have done a good job, which I know most believe that I have, that I have not forgotten them like what happened in the past. I have that touch with the people, whether by phone, on the street or on and off at my office. I feel comfortable and I will work as hard as anybody else, as hard as I have done every time when election is around. But to say that I feel uncomfortable or a lot of pressure, no it doesn't really worry me who they put over there. As long as I know that I am doing my job, so long as I know that the people love me, which I believe they do, there is no doubt about that, and as the days go by you will start to see the love and affection that the people have for me in BRS."